Michael Jordan shoes are a classic of the footwear world. Here you have information and pictures of the Air Jordan XVIII (18). Click image to enlarge it. 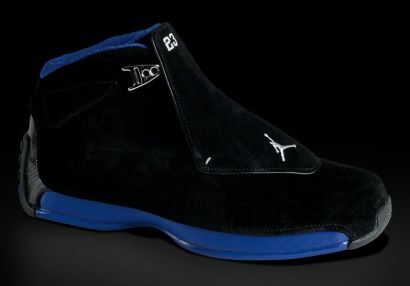 Michael Jordan wore the Air Jordan XVIII (18) in the 2002-03 NBA Season. The XVIII holds the distinction of being the final Air Jordan worn by MJ in his landmark career. But it's also a shoe of firsts. Inspired by Italian high-performance racing cars, the XVIII employs a virtual one-piece upper in addition to a patented carbon fiber Comfort Control Plate and dual-layer Zoom Air Cushioning.